To celebrate Dr. Martin Luther King, Jr. Day, the U.S. government is offering free admission to all 397 of its national parks from January 14 to 16. 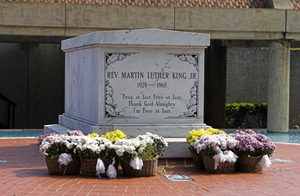 Many of America’s national parks have direct ties with Dr. King and the civil rights movement: Martin Luther King, Jr. National Historic Site in Georgia, the Selma to Montgomery National Historic Trail in Alabama, and the Lincoln Memorial in Washington, DC. Some national parks are holding special events in honor of Dr. King over the holiday weekend: the new Martin Luther King, Jr. Memorial in Washington, DC; Morristown National Historical Park in New Jersey; Fort Donelson National Battlefield in Tennessee; and Frederick Douglass National Historic Site in Washington, DC. The National Park Service will also waive admission fees on 14 other days in 2012 – National Park Week (April 21 to 29), Get Outdoors Day (June 9), National Public Lands Day (September 29), and the weekend of Veterans Day (November 10 to 12).